So I’m 3 days in on my mission to create habits that will help me look like a short Bar Refaeli. And guess what, I still don’t look like her and I feel like I’m hungry all the time. Buuut I do feel really light and I do have more energy, which does not fill the hole pancakes left in my soul. So I had my day one on Sunday, January 19th, which means I’ll finish this mission on the…uughh math. I think it will be on February 10th. So I’m still struggling with the early waking up and with the smartphone addiction. I’m keeping all the other rules though. And this was the smoothie I had last Sunday morning. It’s made of cucumber, spinach and orange and I used water as the base. Tastes a little like water melon. I prepared enough for the whole day and whenever I felt I needed a snack, this smoothie was there for me, singing Lean on me! from Bill Withers. Love this song. And the smoothie sang it almost with the same beauty and depth in its voice. After a few hours I was hungry as a bear. Oooh speaking of bears, did you hear about the deadly panda virus in China? There was something in the news the other day and while it was really sad, I couldn’t help but think how adorable the pandas shown in the footage were. And so flexible for all that chubbiness…They were climbing trees, walking on ropes, doing acrobatics and posing for the camera. I hope they survive that virus and I get to play with them one day. To be more concrete: two of those things. They’re not condoms (!!!!) 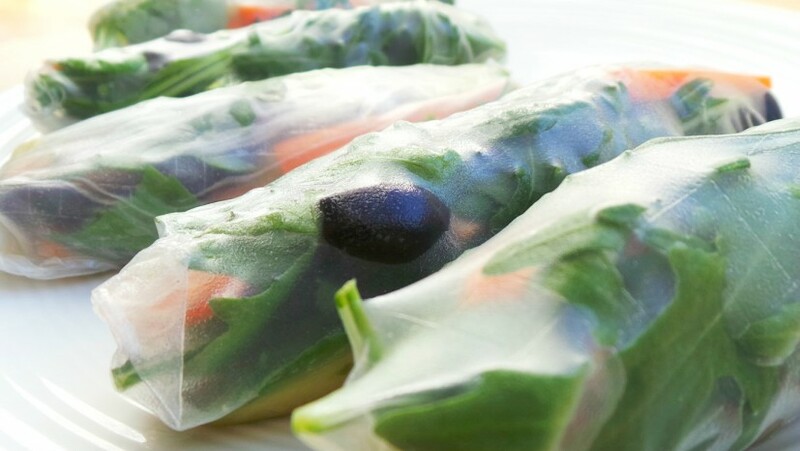 and are filled with avocado, rucola, basil and some other yummy stuff. Tomorrow I’ll put here the recipe. They’re really fresh and satisfying as a snack, and are a lot better than stuffing your face with sweets, when you’re bored at work (speaking from my own experience with boredom) and craving a small bite. Those are not really that calorie-dense, so I was hungry in 2-3 hours and here comes the lunch. This is the better version of fried rice. It’s fried bulgur. Bulgur is not gluten free, so if you have a gluten-sensitivity don’t eat it. But it was goooood. 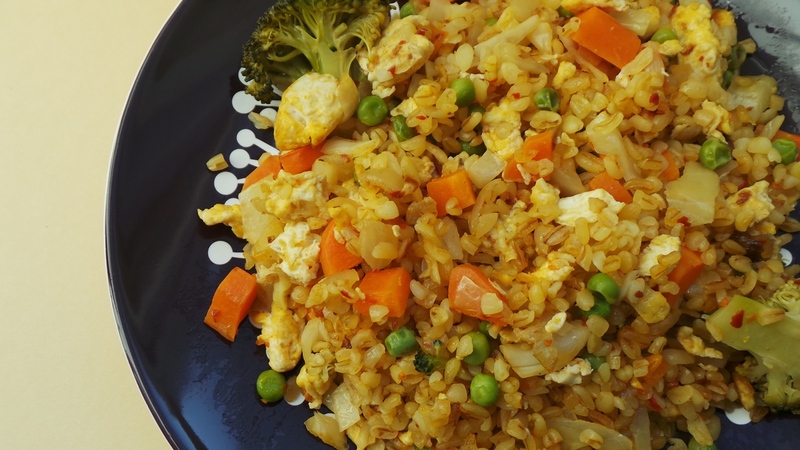 I love to prepare this because it tastes really yummy, is vegetarian, full of vegetables and thanks to our friend bulgur – Iron, and the best thing: it’s ready in about 15 minutes. Not bad for a warm meal ha? Recipe will be here in short. That portion was soooo small for my widened stomach, so afterwards I was still hungry and drank another green smoothie from my morning stock. And it was already 6 pm…sweat on my forehead, bad feeling in my stomach, widened eyes. No it was not diarrhea. It was fear. The fear that just in two hours it will be 8 pm and I’ll have to suppress the fat girl inside of me. And then a horrible idea came into my mind: Go out for pizza! The whole day I was doing so great and then this bad boy comes in the picture to ruin my life. I tried everything to fight it, but after 5 min I gave in. Pizza Tonno!!! (saying it like Italians on TV) It doesn’t look good on the picture and it smelled even worse. Kinda like toilet, as my sister said. And I had to wait for it for about 45 min and to ask the chef to make it, because he had forgotten. Sometimes the universe gives you too many signs, but you eat the pizza anyway. Well I tell you what I didn’t do – Contrary to my and to the expectations of everybody who could smell the pizza, I didn’t get diarrhea. And that was day one food wise. I also did exercises – I love Diane Berry’s Pump it up workout video. It’s so much fun and I feel like I burn million kilograms of fat per second. So I just did the warm up and the dancing part. But I was sweating as if it’s almost 8 pm. PS: Why do I start every sentence with So?? But uhm.